The most dangerous of all the western wildfires, the Rim Fire is now 20 percent contained, reports CBS News correspondent Teresa Garcia. Despite the improvement, it has grown to nearly 180,000 acres (about 280 square miles), and has already destroyed 111 structures, including 31 residences. The fire also still poses a threat to San Francisco's water supply. Erratic winds and inaccessible terrain have allowed the Rim Fire to largely set its own course, forcing firefighters to be reactive as opposed to getting out ahead of the flames. 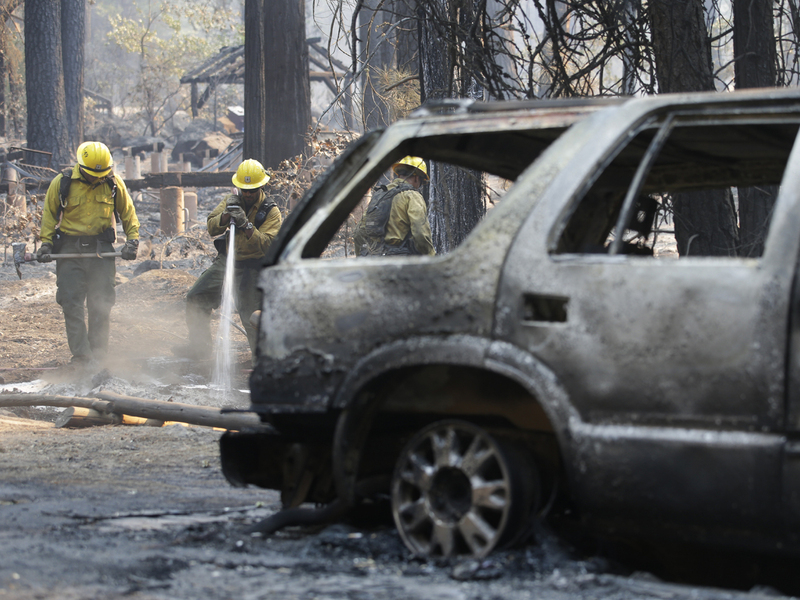 "We can't be directly at the fire's edge," Fire Operations Chief Glen Stratton told CBS News. "The fire's behavior simply won't allow it. The most frustrating part is we've got to let the fire come to us." Nearly 3,700 firefighters have battled the blaze, the biggest wildfire on record in California's Sierra Nevada. "It's been a real tiger," said Lee Bentley, fire spokesman for the U.S. Forest Service. "He's been going around trying to bite its own tail, and it won't let go but we'll get there." The cause of the fire, which began Aug. 17, has not been determined. The inferno has destroyed 23 structures. With some 4,500 structures still threatened, firefighters are doing their best to stand their ground, while knowing firsthand how dangerous this wildfire can be. "This area on the Stanislaus Forest has had a history of fatality fires," said Cal Fire Director Ken Pimlott. "We are very cognizant of the terrain, the fuel conditions and the fire behavior that occurs here." Governor Jerry Brown visited the fire zone on Monday. Like other officials, he's paying close attention to the water quality of the Hetch Hetchy Reservoir (which supplies the city of San Francisco with its drinking water) as the flames have closed to within a mile. "When you burn down everything, you've got a moonscape out there, that with floods can contaminate the water," said Brown. Utility officials monitored the basin's clarity and used a massive new $4.6 billion gravity-operated pipeline system to move water quickly to reservoirs closer to the big city. CBS Station KPIX reports Hetch Hetchy makes up about 85 percent of the San Francisco Public Utilities Commission's water supply. There is a six-month supply of water in reservoirs near the Bay Area, including local reservoirs in Alameda and San Mateo counties. So far the ash that has been raining onto the reservoir has not sunk as far as the intake valves, which are about halfway down the 300-foot O'Shaughnessy Dam. Utility officials said the ash is non-toxic but that the city will begin filtering water for customers if problems are detected. Power generation at the reservoir was shut down last week so firefighters would not be imperiled by live wires. San Francisco is buying replacement power from other sources to run City Hall and municipal buildings. Yosemite fire "poses every challenge there can be"
Meanwhile, KPIX reports that biologists with the Forest Service are studying the effect of the fire on wildlife. Much of the area that has burned is part of the state's winter-range deer habitat. Biologist Crispin Holland said most of the large deer herds would still be well above the fire danger. Biologists discovered Western pond turtles stranded near the edge of Yosemite; their marshy meadow had burned. The surviving turtles huddled in the middle of what little water remained. Wildlife officials were also monitoring at least four bald eagle nests in the fire-stricken area. So far the fire has not threatened the Yosemite Valley, and most of the park remains open to visitors. If there's any good news, it's that as the fire continues to burn to the north and east, the terrain becomes more rocky, the forest more sparse -- so there's less to burn. Temperatures are expected to hover in the mid- to upper-80s for the rest of the week.